Making Gluten Free DeliciousUdi are old school artisan bakers - Udi bakes for taste and that special joy that comes fresh from their ovens. 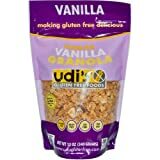 Udi's wish and mission is to share that satisfying, made-with-love happiness with others.Enjoy all of their granolas made in Udi's Colorado gluten-free bakery alongside breads, pastries and other goodies. They're all slow-baked, hand turned and loaded with caramelized flavor, crunch and uncluttered taste. Who needs gluten when you've got delicious?